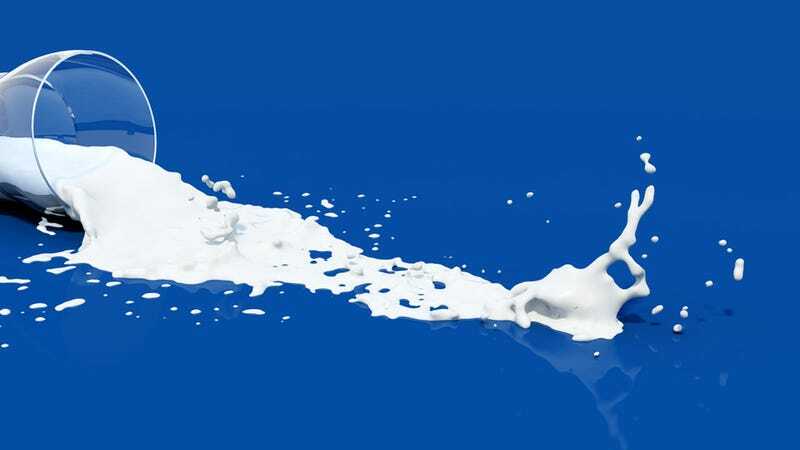 It has been drilled into us since childhood that there's no use crying over spilled milk, but it turns out that spilled milk—specifically milk wasted by people who buy it and don't use it—has a real effect on the environment. Scientists found that the milk poured down the drains of UK's residents has the same carbon footprint as the exhaust produced by thousands of cars. No joke. They say that there are 360,000 tons of milk wasted in the UK every year, and there are roughly 100,000 tons of greenhouse gas emissions created by that milk. That is the same as is released by 20,000 cars in a year. Of course, it's not just milk that's a problem. Food waste in general takes a great toll on the environment because agriculture is a huge source of nitrous oxide, a potent greenhouse gas. So, if you want to shed a tear for the suffering inflicted on Mother Nature by all that spilled milk (and rotten vegetables and spoiled meat), you are well within your rights to do so and the proverbs police cannot come after you.